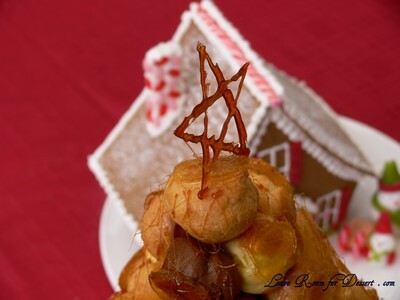 I started craving croquembouche again after the second last celebrity MasterChef. 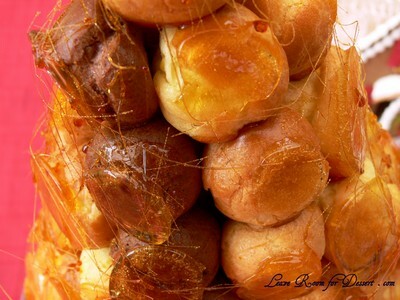 I was craving it so bad, that I didn’t think I could wait until Christmas (which is when I had planned to make my next croquembouche) to eat a custard or pastry cream filled profiterole with the lovely caramel or toffee crunch. The chocolate delice challenge was taking up my time and weekends were being filled so fast with dinners, outings and a gingerbread house, I didn’t know if I would get any Christmas shopping done (I didn’t get much done, lucky I have a wonderful mum and sisters who did most of it, and whom I thanked with this lovely croquembouche along with the rest of Christmas lunch). For Christmas I decided to make Adriano Zumbo’s chocolate swirl croquembouche, as I was intrigued by the chocolate profiteroles, but I still wanted the original gorgeous profiteroles too. Others and myself looked around quite a bit to find isomalt and the white food white colouring, but were unable to find any in shops – a few places online look as though they sell it. So, instead I decided to make some royal icing butterflies to go on top (using the leftovers from my gingerbread house). After comparing these quantities to those from the first croquembouche, I decided to cook half the quantity of choux pastry (for the normal and chocolate ones) and a bit more than half the caramel (although I should have made the full quantity of caramel/toffee, as I was making the base and the extra was required for this). 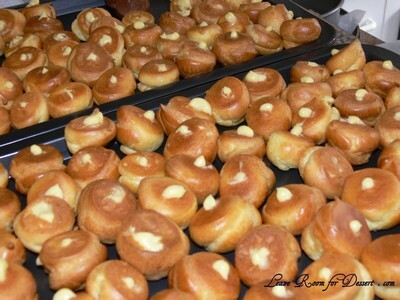 I think it’s better to have left over custard than profiterole cases and toffee. The half amount of choux pastry made almost the perfect number of profiteroles for the vanilla pastry cream. I ended up with a decent amount of chocolate pastry cream left over, but I’m not complaining – as both pastry creams are delicious. I ended up making quite a large filled croquembouche this time around, although probably wouldn’t recommend one quite as large, as mine only lasted long enough for the photos before crashing down. The next day all the caramel/toffee had dissolved into a large sticky puddle, even though the profiteroles were in an air tight container. We had a large amount of humidity on Christmas day. I’m really happy I tried the chocolate swirl croquembouche, although think I would stick to the normal one in future, and make the tower a bit smaller. 1. 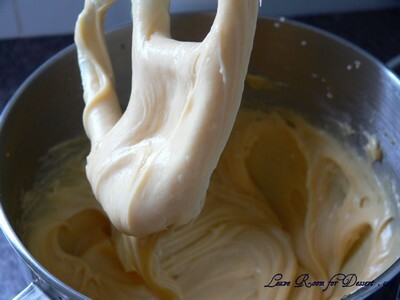 To make the pastry cream: place milk and vanilla beans into a large saucepan. Heat gently over medium heat until milk almost boils. Remove from heat, discard vanilla beans and set aside. 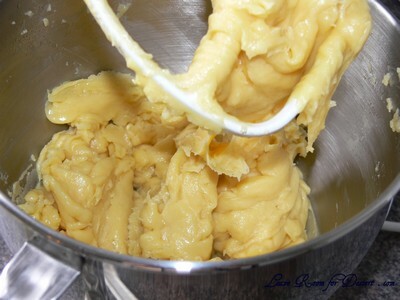 Beat egg yolks, sugar and cornflour with electric beaters until thick and pale. 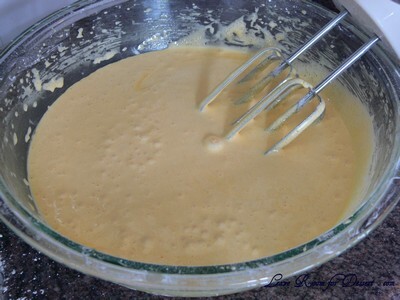 Gradually whisk in the warm milk and return mixture to the same pan. Stir over medium heat until the custard boils. Remove from heat and pour onto flat tray, spread out to cool rapidly. 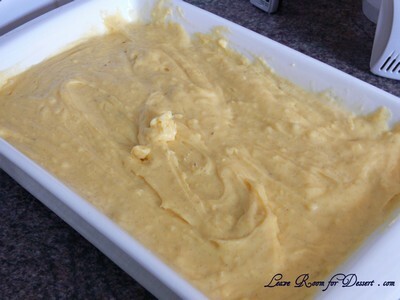 Cover the surface of the custard closely with cling film, to prevent a skin from forming. Use a candy thermometer to check temperature of custard. 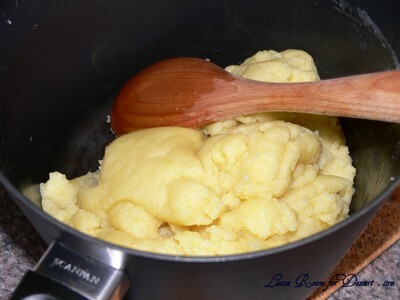 When mixture has reached 55ºC, stir through butter and refrigerate, still covered, until completely cooled. The custard mixture was too much for the bowl I had. So I whisked in 1 litre of the milk mixture into the bowl with the egg yolks and sugar, before straining it all back into the remaining 1 litre of milk in the saucepan. 2. To make the chocolate pastry cream: place 750g of cooled vanilla pastry cream, chocolate and cream in a saucepan and reboil. Pour onto a tray, cover with cling film and refrigerate until completely cooled. 3. 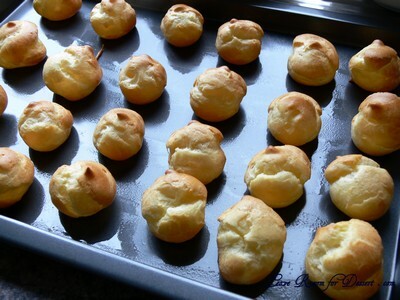 To make the choux pastry: preheat the oven to 210ºC convection. Lightly grease 2-3 large oven trays and set aside. Combine the water, milk, sugar, salt and butter in a large heavy-based saucepan and bring to the boil. Remove from the heat and using a wooden spoon quickly beat in the flour. Return saucepan to the heat and continue beating until the mixture comes together and pulls away from the sides of the pan. Cook stirring over low heat for a further 1-2 minutes to cook out the flour. Remove from heat and allow to cool slightly. 4. Using hand beaters, beat the mixture to release any more heat. (I used my KitchenAid to get rid of a lot of the heat before adding the eggs). Gradually add the eggs, one at a time. Beat well between each addition until all the eggs have been added and the mixture is thick and glossy (a spoon should be able to stand upright in it). Beat for several more minutes, or until thickened. 5. To make the chocolate choux pastry: repeat step 3 & 4 to make chocolate choux pastry adding the cocoa powder with the flour. 6. Spoon the mixtures, in batches, into piping bags fitted with a 1.25-1.5cm nozzle. Cover remaining pastry with cling film. Pipe mixture onto trays about 2.5cm x 2cm high leaving room for spreading. Bake for 25-30 minutes, in batches, or until firm and hollow when tapped. Transfer puffs to wire racks. 7. Spoon custards into separate piping bags with a nozzle less than 1cm. Poke a small hole in the base of each puff and fill choux pastry with vanilla pastry cream and chocolate choux with chocolate pastry cream. Set aside. 8. 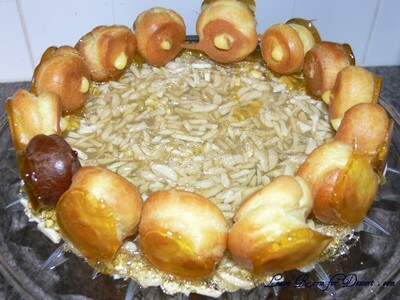 For the caramel: grease a cake ring with cooking spray. Combine water and sugar in a saucepan until it boils. Add glucose, and cook until syrup turns a caramel colour. Remove from the heat and dip the base of the pan in a bowl of cold water to cool slightly. Pour just enough caramel to cover almonds and mix well; pour almond caramel into ring to form a 5mm base. This is the base for the croquembouche. 9. 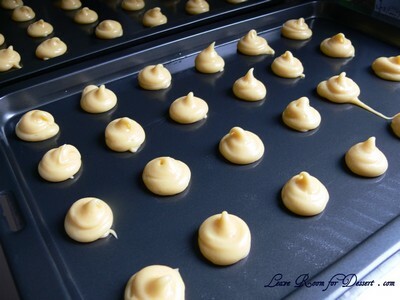 Dip the puff bases (I dipped the tops of the profiteroles) in enough toffee to coat and place upside down on a tray lined with silicon paper or silpat mat. (I used baking paper, which worked reasonable well). 10. Combine isomalt and water in a medium saucepan and bring to the boil over high heat. Using a candy thermometer, bring mixture to 160ºC. Remove from heat and add white food colouring. Mix well; mixture will turn completely white. Slowly add drop by drop of colours and swirl pan to mix slightly. Pour into silpat moulds, reserving 1-2 tablespoons of mixture. 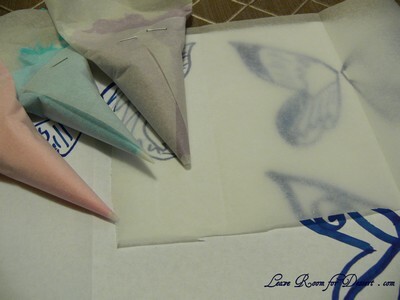 Stand butterflies for 5 minutes or until hardened. 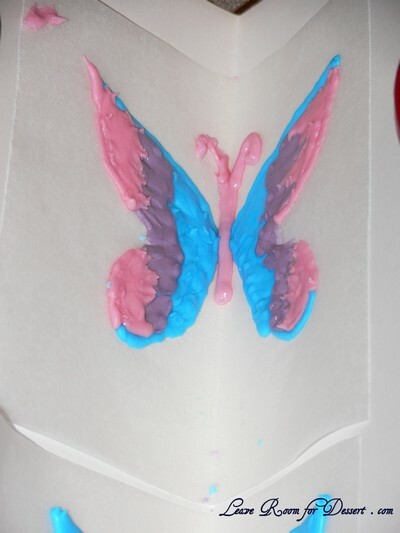 I improvised and made royal icing butterflies, by piping different coloured royal icing onto baking paper – be careful – they are fragile (two of my three fell apart. 11. To assemble: oil the inside of the croquembouche cone. 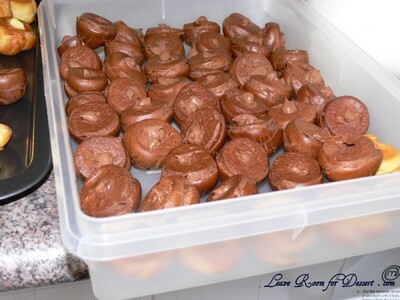 Dip the sides of the puff balls in the toffee one at a time and place around the inside of the cone in a single row. Place one chocolate ball in each row, to the bottom right of previous chocolate ball. Continue adding rows of vanilla balls and single chocolate balls until the cone is filled and the chocolate balls forms 2 spirals pattern. Place a small amount of caramel on the last balls inside the cone. Place base inside the cone, gently invert cone and slide off the metal cone. 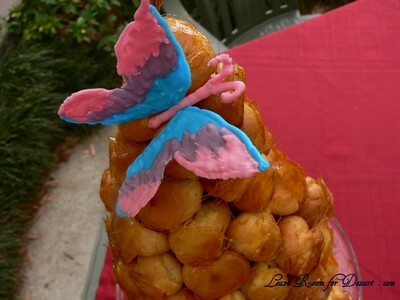 Using reserved isomalt mixture, dip butterflies into mixture and fix to top of croquembouche. 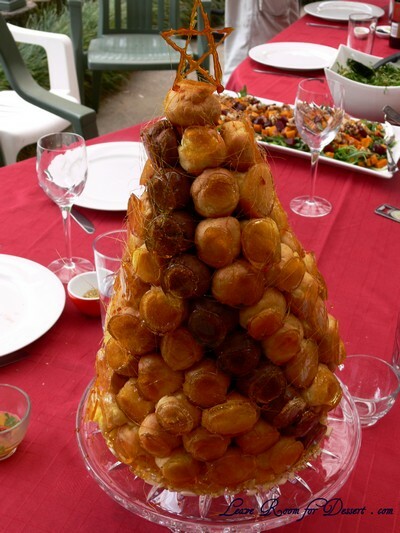 Note: I built my croquembouche from scratch, although it was too tall to stand by itself. I may have needed to use more toffee to hold it together. I would make a smaller one in the future. Filed under Cakes, Slices and Biscuits, Chocolate, Dessert, Egg Yolks, MasterChef, Pastry, Recipes. You can follow any responses to this entry through the RSS 2.0 feed. You can leave a response, or trackback from your own site. Wow, that’s humungous! 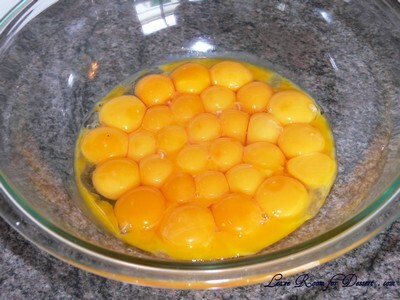 I don’t think I’ve ever seen so many egg yolks in a bowl. 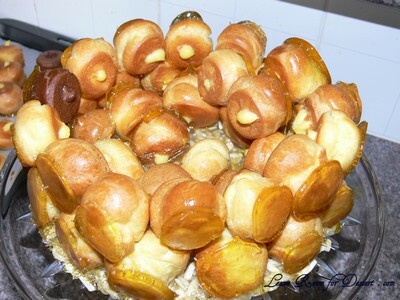 I like the idea of combining both kinds of profiteroles. Extraordinary! 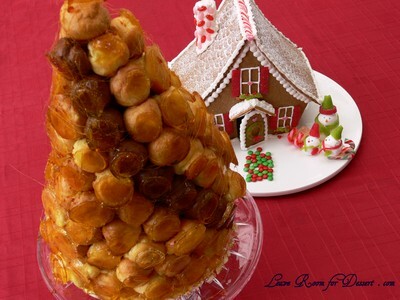 The croquembouche is like the king of all extravagant pastries. Your family must have been so impressed! What a masterpiece! I’m in awe! What an amazing feat! I, too. am in awe! WOW! Labor intensive and VERY impressive!!! That is fantastic. 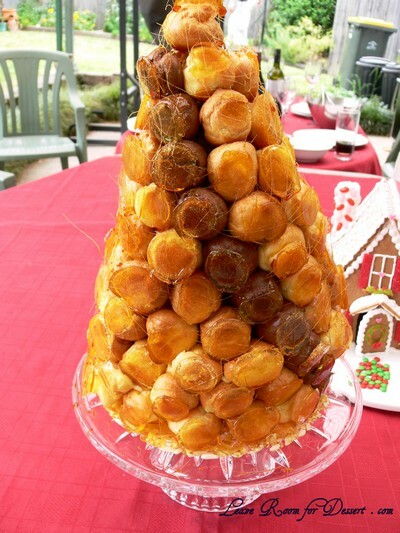 I had a croquembouche tower for my wedding cake – I’ve never made one myself but I love your one! That is stunning! I think your royal icing butterflies are beautiful 🙂 You’re a Zumbo in the making! Wow! Amazing you did this – has any one ever told you that you should go on masterchef?!?! I am really really impressed. A mammoth effort! What a way to celebrate Christmas (who cares if it collapses later, as long as everyone can ooh and aah at it!). And your gingerbread house looks so cute in the background. Wow, you did a great job! It looks really beautiful! 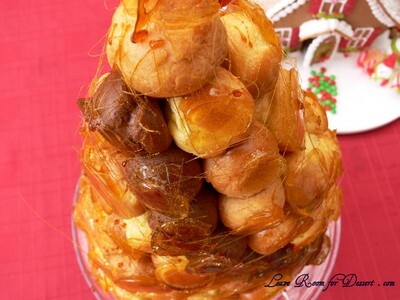 Your croquembouche looks fantastic, I bet it tasted devine! 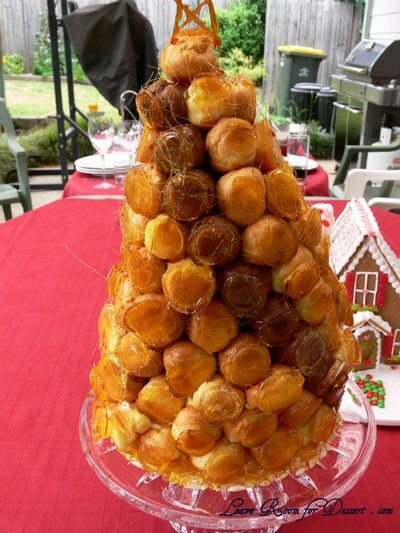 I made an attempt on a croquembouche yesterday, It certainly didn’t look as spectacular as yours, I had some trouble with the profiteroles, after they can out of the oven they went flat and soft losing all of their puff. 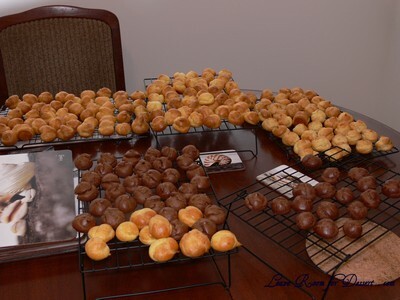 I admit I used a different recipe as I didn’t want to make as many, so the recipe I used made only about 20 puffs, what do you think was the reason for the deflated puffs? 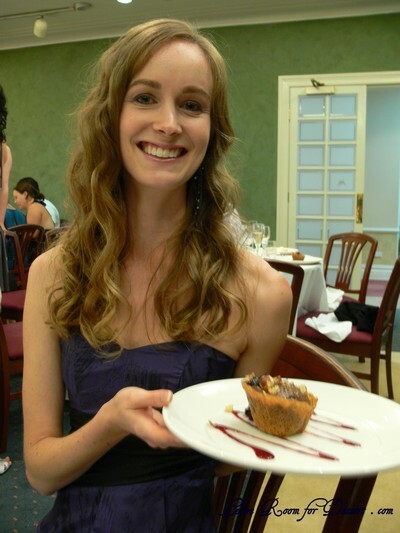 I hope you can help me… regardless it tasted awesome! Wow! Where do you find the time for these??? I am impressed yet again by your cooking/baking skills. It looks amazing. Your family is so lucky. I have no words for this… I really don’t. This and your gingerbread house are the awesomest of all the awesomest I’ve ever seen ever ever ever!!! Having just watched the episode on Celebrity Masterchef .. I can see what a wonderful job you have done. Do you know if the recipe could be adapted to make a smaller one? .. I want to make one for valentines day for my husband and I to share. Probably one of the few males who have read this and being an absolute bum amateur, I measured all the bits out for the vanilla cream (actually I used Kalua), got most of the way with cooking the stuff to a nice consistency and noticed a small plate with 200g of butter on it. As is my wont I used lots of culinary terms about my efforts as a cook but try as I might there was no indication as to when and where the butter is used? So I left it out. Tomorrow afternoon I will be constructing the ediface. If it all falls flat at least I can blame the lack of butter!! 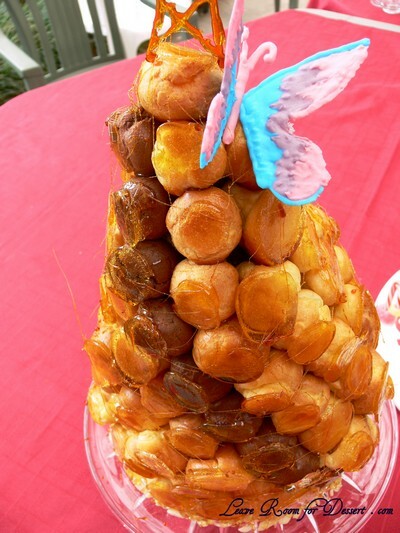 but im a bit confused about the assembling if the croquembouche. and if i wanted to use a croquembouche cone how would i go about assembling it, ive heard you’re meant to place the profiteroles inside the cone, but how would you get it out afterwards wouldnt it be stuck because you have to use toffee to stick it to the inside of the cone? Wow, I just try searching and accidentally drop on your site… I really love your blog, you really inspired me. 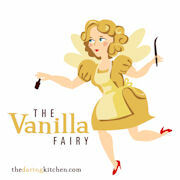 I love baking and I love searching recipes for dessert or pastries.